Spring is arriving everywhere, which means it’s time to start all preparations for the warm weather to come. During the colder months, a lot of the tools and equipment that’s used during the spring and summer is neglected for a long period of time. However, the beginning of spring is the perfect time of the year to perform routine maintenance on all your equipment to avoid losing any productivity or setbacks. Take advantage of these extra hours of sun light and start tuning your equipment for spring. There are many tools that go into one’s spring tune up year after year. If you don’t already have your own list of tips and tricks, then this article is for you. I recommend starting with the larger pieces of equipment and working your way down to the smaller items. Making the most of your spring tune-up is primarily about increasing the performance and longevity of the equipment you are using. All power machinery such as lawnmowers, edgers, and rototillers need a little love after resting all winter. The life span of any gas machines is dependent on the level of maintenance and care performed on it over time. Machines that are given a proper tune up year over year last longer than those machines that receive zero care. When tuning up your machine, start with sharpening the blades. 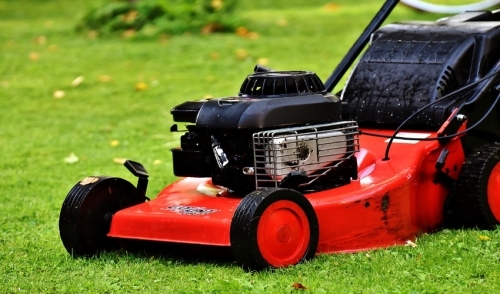 The blades of your lawnmower, chainsaw, hedge trimmer, and other outdoor cutting tools should be cleaned and sharpened prior to their first use of the season. A clean cut in the yard enables grass, shrubs, and gardens to grow back stronger and healthier. Next, remove any old fuel from gas powered machines and replace it with fresh gasoline before starting the engines. Without the addition of a proper stabilizer, fuel can go bad if stored for longer than a month. The use of old fuel can degrade your machine’s engine and leave a gummy build-up within the pipes causing a decrease in overall performance. Don’t forget to also check the spark plugs. Spark plug replacement is one of the most common issues homeowners face when attempting to restart their machines after a long winter. Before immediately replacing them, try removing and scrubbing the spark plugs clean in an attempt to start up the machine. If the machine still won’t start even after using fresh gas and cleaning the spark plug, visit your local outdoor supplier for a replacement. As a general rule, spark plugs should be cleaned or replaced after an estimated 100 hours of use, or every season, whichever comes first. Lastly, check the tires and cords of your machines before use. Cords should be checked for damages and replaced as needed. Tires must have good pressure and should be inflated if necessary to meet your needs. For the remaining tools and equipment that are not powered by gas or electricity, double check for general wear and tear. Look for rust accumulation, holes or tears in hoses, and anything else that may look suspicious before use. Tools and machines need maintenance and care to maintain general performance over long periods of time. Use the tips on this article to better prepare yourself for the warmer months ahead and to get the most bang for your buck out of the equipment you have invested in to improve your garden and home. Take action before it’s too late and start tuning up your equipment today.